Not everyone wants their baseball cards to be pretty, but that's just what 2015 Topps Stadium Club is. Sticking with its roots of being a set that showcases great photography, the base set comes through in spades. Action, portraits, casual moments -- the set truly has it all. All that's missing is Evan Gattis in a bear suit, but that's okay. A growing reality in the hobby is how a lot of images are used over and over again. And then they pop up again. Even with a good shot, it's disheartening and takes away from a card's individuality, no matter how different the design. 2015 Topps Stadium Club takes a fresh approach. Not all the photos are new to baseball cards, but those that aren't haven't been seen in a very long time. There might be a couple of exceptions, but none that popped out at me right away. A great base set might not translate into huge secondary market activity dominated by autographs, memorabilia and rare hits. But this isn't necessarily a set for fans of such things. It's something for those who want to chase a set that stands on its personality. There are autographs and some rare inserts like Crystal Ball, but that's not the biggest focus. The images are. 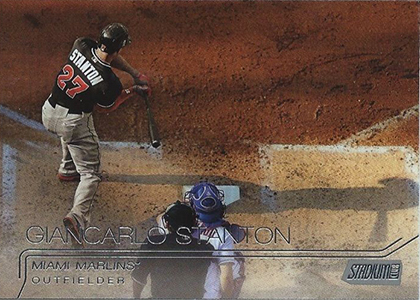 And with that in mind, here are 15 great photos from the 2015 Topps Stadium Club base set. 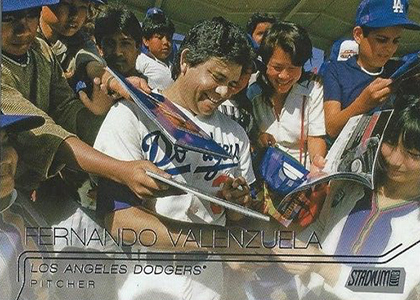 2015 Topps Stadium Club Baseball kicks off with full-on Fernandomania. And look at all those smiles. It's hard not to do the same looking at this picture. The lighting, the angle, Stanton's imposing shadow -- this shot captures the beauty of the game in a very natural way. 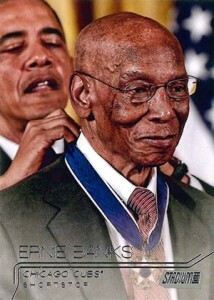 Humbled comes to mind with this shot of the late Ernie Banks getting honored with the Presidential Medal of Freedom in 2013. Mr. Cub might have been in the latter stages of his life but you can still feel that warm twinkle in his eye. And for those Presidential card collectors, there's a notable guest star in the background. This might be the most 3-D card ever without actually being 3-D. You want to duck out of the way just looking at Pudge charging into foul territory to make the play. With a little different cropping, this is a pretty mundane card. But with the scoreboard, there's an entire story happening with Holliday making a home run trot. Not all the baseball action takes place on the field. 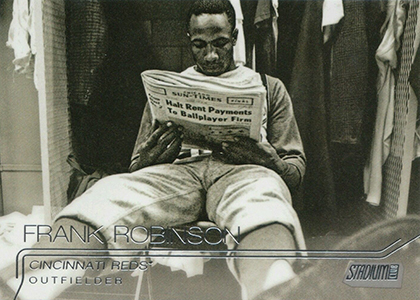 This shot of Frank Robinson was take in 1962 from the Busch Stadium clubhouse. You've got a legend relaxing, an intriguing headline and some sweet fashions in the background. But what really makes it pop is the perspective with Robinson's feet drawing your eye right to him and the locker framing it nicely. Here's a shot one doesn't forget. 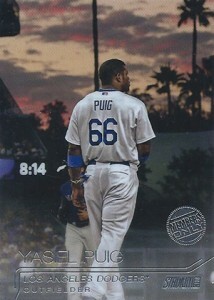 Yes, it has almost but not exactly been on a baseball card before. But that was almost 20 years ago. 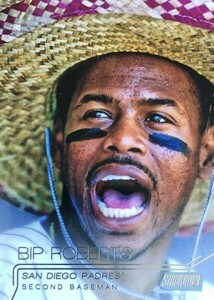 And it's Bip Roberts in a sombrero. An animated Bip Roberts at that. What's not to love? 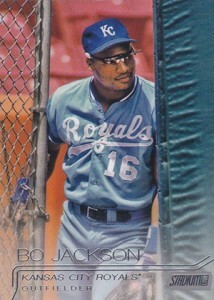 What is Bo Jackson up to? It's not just the fact that he's poking through the gate that's more than a little curious. You've got those stellar flip-up shades that were all the rage back in the day. It's a little mischievous and lots of fun. That sky. Those palm trees. 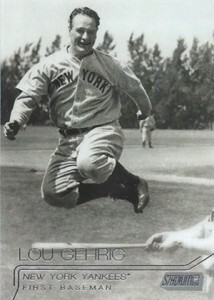 That's L.A.
Lou Gehrig isn't famous for his smiles. History makes him out to be a serious, hard-working superstar whose life was cut short. This card shows a different side of Gehrig. Not only is he smiling, but he's up to something. Is he sliding? Playing some form of jump rope with a bat? Who knows, but the full image shows even more star power. So young. So popular. The golden colors. George Brett was one of the most popular players of his generation. And it didn't take long for him to be embraced by the fans as this stellar shot from 1976 shows. Mascots make everything better. Mascots of players with massive mustaches are better still. 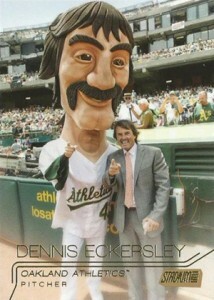 Just don't look at the neck because it looks like Mascot Eckersley is choking on the Swedish Chef. And that's creepy. 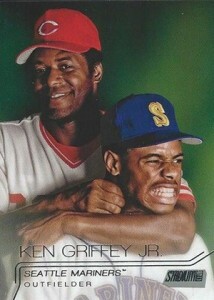 This isn't the first time that Ken Griffey Jr. has been pictured on a card with his dad. Lots of them exist. 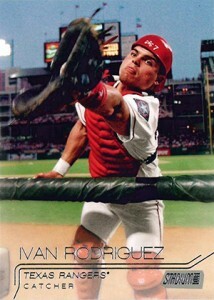 This one shows a much goofier side to the family you might not normally expect on a baseball card. 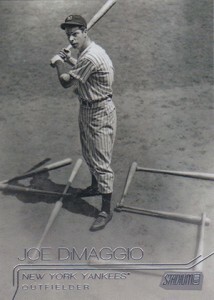 Joe DiMaggio wore #5. He's famous for a 56-game hit streak. So what's with the 45 made out of bats? It turns out it's from 1941 when the Yankee Clipper set a record for consecutive games with a hit at Yankee Stadium. 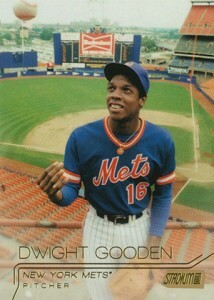 Dwight Gooden's story has had its ups and downs, but this shot captures the magic of his early years. He's in full control, on top of the world (or at least mid-level in the stadium) and captured with some glorious colors. What's your favorite card in the set? What makes a great-looking card to you? Let us know in the comments below? 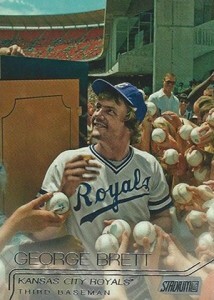 The George Brett card photo was from a National Geographic magazine issue. The photo was the inspiration for Lorde’s single “Royals”. 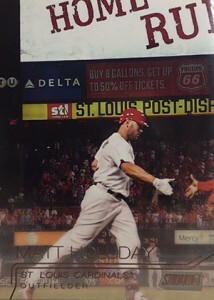 The kolten Wong image was used on his topps opening day 2015 card.